There are two kinds of people: those who like to camp, and those who don’t. I fall squarely in the second category — not because I hate the great outdoors, but because I’m fond of hot showers and comfy beds. 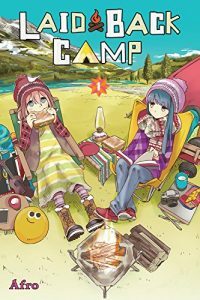 Still, the prospect of reading a manga about camping intrigued me: is camping popular in Japan? Is the s’more a hit in Japan, too? And what about bears? Laid-Back Camp didn’t answer all of my questions, but it definitely earned a spot on my pull list. Read on for details. Laid-Back Camp may be the most quintessentially Japanese thing I’ve read this year: it features cute girls doing cute things while imparting information about camping gear. There’s no real plot to speak of, just a meet-cute in the first chapter that introduces seasoned camper Rin to enthusiastic newbie Nadeshiko. Through one of those only-in-manga coincidences, Rin and Nadeshiko attend the same school, where two other girls — Aoi and Chiaki — are struggling to recruit members for their Outdoor Exploration Club. You can guess what happens next: Nadeshiko joins the club and, by dint of her Golden Retriever personality, brings the skeptical Rin into the fold. Each chapter is built around a skill, a piece of equipment, or a location. In “Mount Fuji and Cup Ramen,” for example, Rin explains how to build the perfect campfire, calling dried pine cones “nature’s premier fire starter,” while in “You Can Only Go Camping If You Have the Gear,” the Outdoor Exploration Club pores over catalogs, debating the merits of down and synthetic sleeping bags. These passages are deftly woven into the fabric of each story, playing a natural part of the girls’ conversations as they plan camping trips. Dashes of humor and breath-taking scenery add welcome nuance to the storytelling, preventing it from tipping into edu-manga dullness or yon-koma hijinks. Best of all, Rin is a genuinely interesting character, a small, self-sufficient kid who likes solo camping trips. 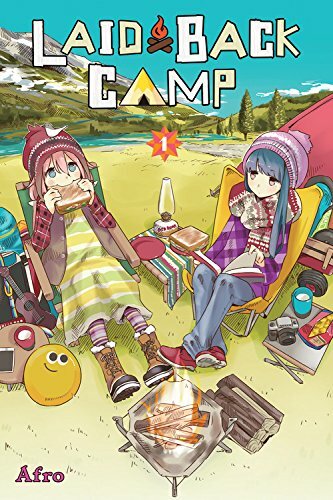 Though volume one doesn’t explain how she caught the camping bug, author Afro has done such a good job of fleshing out Rin it doesn’t matter; we can see how someone so introspective and independent would welcome the opportunity to be alone in nature. Recommended, even for those who prefer the Great Indoors. Shinohara’s planets are such magnificent fictive ecospheres, and his examples of imaginary science so instantly credible, that one takes him not only for a mangaka, but an authority on exobiology and exogeology. Shinohara builds these planets from the ground up, so that one has an idea of not only their climate, and the evolution of their biosphere, but the physical and astronomical data of the planet; and even when these aren’t directly stated, one gets the idea that they’re under the surface somewhere. Moreover, these planets would only be slightly more believable if he had photographs, for he is an excellent line artist not only of teenagers and sci-fi hardware–common skills in comic book creators–but of alien lifeforms and alien worlds. Also worth reading is Martin de la Iglesia‘s essay “Has AKIRA Always Been a Cyberpunk Comic?”, an in-depth look at the manga’s reception in the US and Germany. * Denotes a digital-first or digital-only release.